NYC, 02/20/2019, 7:00PM. Wonderland: Nonimaginary People in an Imaginary Town. Kate Douglas's Wonderland is a story of nonimaginary people populating an imaginary town. 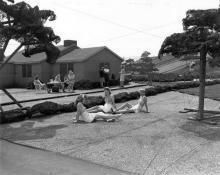 Wonderland is a staged suburb built to conceal a World War Two fighter jet factory in case the Japanese bombers fly over. Three actresses have been hired to live ordinarily as townspeople as a finishing touch. But World War Two never ends, and the summer job stretches on forever. Wonderland questions the meaning of authenticity and denial in a manufactured world where imminent doom is possible in every moment. Kate Douglas is a multidisciplinary theatre artist seeking to challenge audiences about the limits of their world. Her work has been performed at Ars Nova, Joe’s Pub and The McKittrick Hotelr. She is the recipient of a Lower Manhattan Cultural Council grant in support of her immersive work Extinct, which debuted in winter 2018.